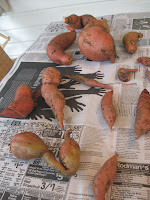 I dug out the Sweet Potatoes from my community garden plot today. I grew one hill of 'Beauregard' and the other of 'All Purple.' Both from slips courtesy of Southern Exposure Seed Exchange. As you can see by the pictures, one variety is much bigger than the other. I think 'Beauregard' should be renamed 'Big Boy.' I'm now curing them in my sunroom. As I carried the big harvest basket across the street back to my house, I was stopped by a young student walking to Montgomery College down the street. "What beautiful colors!" she exclaimed. And indeed, my garden haul today, in addition to the sweet potatoes, was a lovely combination of the latest fall fashion hues. 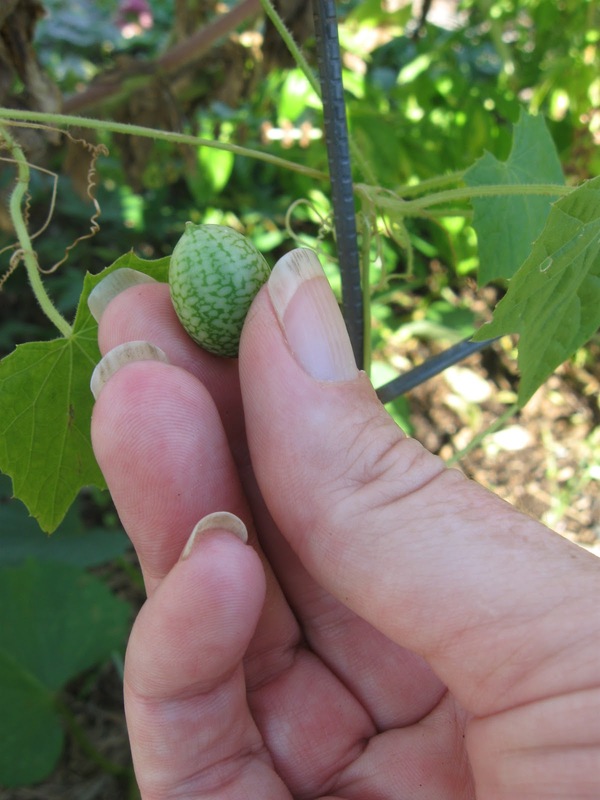 Here is a Mexican Sour Gherkin Cucumber (Melothria scabra). I grew it at my community garden plot and finally got a few tiny guys to show for it this past week. I ate one - very nice - more like a pickle than a cucumber. Sensitive Fern (Mimosa pudica) is an unusual plant that responds to touch. Have you ever petted a plant? This was films at the museum shop at Monticello, Charlottesville, VA.
For our September 2012 Washington Gardener Magazine Reader Contest, we asked: "What is Your Gardening Pet Peeve?" We selected randomly among the entries and the following individuals each one a set of two passes each (prize value $20+) to the upcoming DC Green Festival this week at the Washington Convention Center. Washington Gardener Magazine will be there with a booth and Editor Kathy Jentz will be hosting a talk on Cool Season Edibles on Sunday at 3pm. I thought colored mulch was bad, that is until I saw someone in our neighborhood paint rocks (4") a bright blue to simulate a steam running through their front yard. They then painted white accents on some of the rocks, so then it was a "rushing" water....so tacky!!!! By far, my biggest gardening pet peeve in the garden is the pesky POKE WEED. They grow fast and large, and their taproots are impossible to completely remove. The bane of my woodland garden, for sure. Oh easy - disappearing ink on variety labels!!! My pet peeve is rabbits. I have cats (2 my own) wander through my garden but they only nibble on the grass. I have gardened in the Washington area for 50 years and I never thought rabbits would be a problem - I have always thought of them as taking a few things from Mr. MacGregor's garden! Yet here they are munching on my tender hostas, cutting down new shoots from my blueberry bushes like they were lettuce, and being told that they will munch through anything except wire fencing! Since they are becoming more prolific, I have found more information on them, and seem to have found that a mesh fence will keep them out, as long as it's about 2 feet high and staked into the ground. My garden pet peeve is WEEDS!! While the rest of my garden might be struggling due to too much or too little rain, high humidity or drying winds, and various pest and diseases, the weeds are always there, growing strong and taunting me so that if I neglect my garden for even a week, they will take over. The worst of the weeds is what I call the "Invasive Vine Cocktail", a discouraging mix of Oriental bittersweet, catbrier, Japanese honeysuckle, English ivy and various other non-natives, that are ready to pounce and smother my garden no matter how often I beat them back. My gardening pet peeve is when gardeners buy plants (in pots) and never transplant them into the ground. They leave them in the pots and not water them. I assume they intend to plant them or forget or get too busy or whatever. The plants eventually die in the pot. Gardening Pet Peeve? Weeding! Especially when you have roommates that have different opinions on what a "weed" is. My "Pet Peeve" has to do with weeds in my garden. If my beloved plants only grew so vigorously I would be a very happy gardener! It seems in my garden that weeding is a never ending task. As soon as I think I've got them all up, another appears. Perhaps its best to change my attitude about what plants are weeds! LOL. It pains me to write this, but my pet gardening peeve is my family. I like to think that I've worked miracles on a site that is very large and very shady by creatively converting the front yard and lawn, the only sunny spot, into a wonderful mix of flowers, shrubs and vegetables. I built a retaining wall using broken concrete to level out the slope, topped it with rose bushes, and placed the vegetable planters behind them so the tomato vines aren't visible from the street which would offend the neighbors. I am currently planting a hedge of deer resistant shrubs and perennials along the street edge of the front yard, behind which I will string deer fencing to keep them out. I think it's beautiful--the rest of my family hates it! They want grass and conformity. As for the large and shady backyard, I am creating small garden rooms, starting nearest the house and eventually to work further out (where it is currently a tangled mess). I love doing this, too, and have been given full reign. But my family asks why I can't abandon the front and return it to its former lawn glory. My peeve: they don't understand why a gardener might want some SUN, too! At farmers market when I see non seasonal fruits/vegetable with stickers mentioning "Product of Brazil/Mexico ...." we know all fruits and vegetable grow in farms, I don't get what does a local farmers market means when i see this, we can get the same in the store too Why people come to farmers market, to buy the local produce !!! My Gardening Pet Peeve is Poison Ivy - How can this stuff shape shift in my yard and get me time after time? I have just finished my THIRD course of Prednisone so far this year. I own every concievable potion to keep from getting exposed, garden in laytex gloves, wash in TechNu and get it again. I can't seem to recognize it in the yard, can't wash it off me fast enough, and can't seem to develop enough immunity to it to go out and pull weeds in the yard without getting another case of POISON IVY - yes it is my gardening pet peeve. And no I did not grow up here, but I knew its cousin poison oak in California. My gardening pet peeve is toxic fertilizers; it is an oxymoron, IMO. It looks like weeds are the clear pet peeve champions. And your editor's gardening pet peeves? Where do I begin? 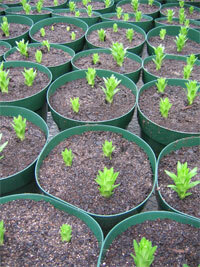 - Plant pots with no (or too small) drainage holes forcing you to get out the drill and risky personal injury. - Inadequate plant labeling or missing labels. List if it is an aggressive spreader and of the plant's full, mature size (not just size in 5-8 years)! - Not enough sunlight hours in the day this time of year. 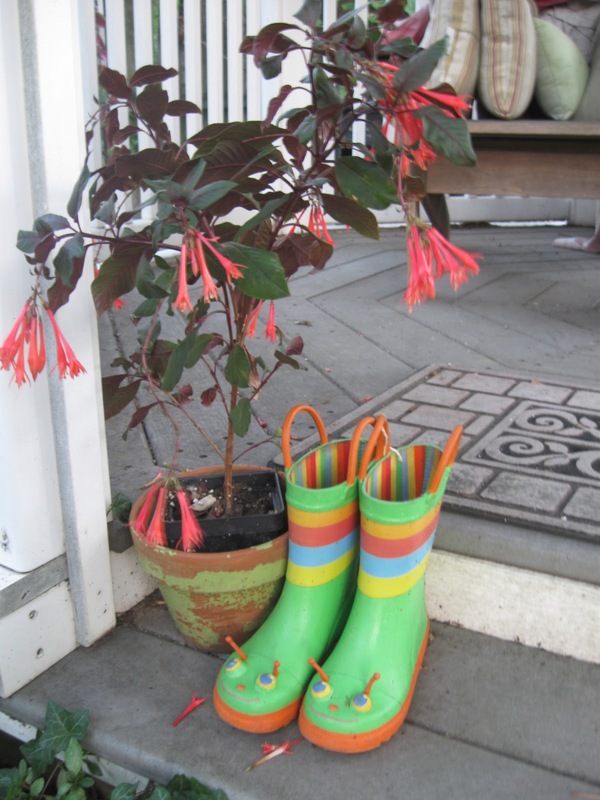 - Garden tools that are green or brown, please make them with brightly colored handles. So what are YOUR gardening pet peeves? For our September 2012 Washington Gardener Reader Contest, we are giving away several passes to the upcoming DC Green Festival. To enter to win a set of two passes, send an email with “Pet Peeve” in the subject line to WashingtonGardener@rcn.com by 5:00pm on Monday, September 24. In the body of the email please include your full name, email, mailing address, and tell us: “What is your gardening pet peeve?” The winners will be announced and notified by September 26. 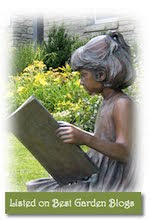 Some of the entry responses may be used in future Washington Gardener online or print articles. Okay, so Obama (nor his wife) have bothered to make the very short journey to my garden, but two other presidents have figured prominently in my community garden plot this week. First, is the namesake of the big, juicy, red tomato pictured here. 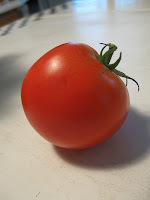 It is the heirloom 'Abraham Lincoln' tomato. It is the ONE -- count them -- 1 fruit I have gotten from this plant that I got as a seedling from the USDA at their 150th anniversary celebration this past June. I may get more from it before the season is out, but I'm pleased as punch with this one, perfect, blemish-free example. Hate to eat it. Right now he is the centerpiece display of my kitchen island. The second president to "visit" my garden plot this week is Thomas Jefferson. I spoke at the Heritage Harvest Fest at Monticello last week and while there purchased a 4-pack of Calabrese Broccoli seedlings from the museum gift shop. They are somewhat gangly and hard to photograph, but they are growing and doing well, unlike the broccoli I started from seed a few weeks ago that never seem to be happy and have all but disappeared at this point. I'm on my way out now to put a floating row cover over the Jefferson broccoli as I will be very ticked if the beetles get them before I can harvest any florets. I'd feel like I would be letting old "Sage of Monticello" down. What dignitaries are visiting your garden this week? so you can access it anytime. Seed Swap during the Heritage Harvest Festival 2012 at Thomas Jefferson's Monticello, Charlottesville, VA. The event is hosted each September by Southern Exposure Seed Exchange. 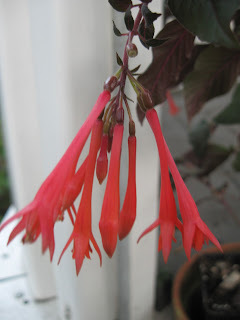 So what is blooming in YOUR garden this Garden Bloggers' Bloom Day - September 15, 2012? 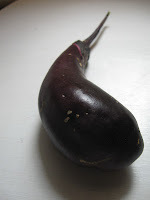 This eggplant sat all summer long and finally gave me one decent fruit. Another one is hanging on the plant right now, but it is relatively puny. I look around at the neighboring community garden plots and see some eggplants going gangbusters, what is their secret? 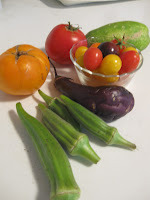 We are supposed to be a completely organic community garden, but sometimes it does make one wonder when you plant the same seedling, purchased from the same source, and one plant gives gobs of goodies all summer long and your plant is just "eh." Should I be calling the MiracleGro police? Or am I just a Bitter Betty? Ah well, I have plenty of other produce from my garden this week to keep me busy. I should tend my own garden plot and stick to my own business, right? 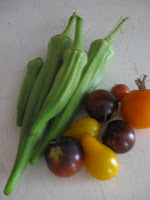 The okra and cherry tomatoes are loving the sunny days and not-so-sweltering temperatures, as am I! 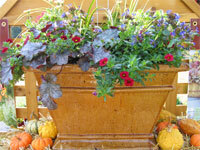 It is past time for me to start Fall greens and I am mulling over building a cold frame. As I said, I have enough to do to keep out of trouble, for now. Plant More Plants is running this new commercial on local television. Their aim is to: "Wage war on stormwater runoff and Chesapeake Bay pollution, all while making your yard better than your neighbors'." You cam visit www.plantmoreplants.com to find out more. Don't forget to also sign up for the next two Thurday talks in the series. There are still some spots left in both these sessions. You can sign up in advance or at the door. Here are the full descriptions. Plants that have proven themselves in the Mid-Atlantic. Low-maintenance gardening is the goal of many of us in our busy lives and the key is planting the right plants got our local climate. We'll talk about some native plants, of course, but mostly we'll explore the tried-and-true plants that can take clay soil, deer, and/or periods of drought. Season-by-season, we'll share our favorite plants in that excel in our local gardens. So you have been gardening for a few years, but still feel like there are some holes in your gardening knowledge and you are frustrated by a few obstacles? This class is for you. We'll take it to the next level and talk about local gardening challenges like poor landscape drainage, gardening on a slope, dealing with deer, planting in clay soil, etc. 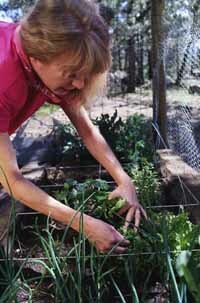 We'll examine case studies of local gardeners who have conquered these common garden challenges. Why go to the bother of collecting all those tiny seeds? The first reason is thriftiness. No need for anything in your garden to go to waste. Compost, recycle, and re-use. The second reason is frugality. Why buy new plants every year when you can grow your own for free? Even further, why buy unproven plants or seeds when you know the ones you are collecting from did well and obviously flourished in your yard. The final reason to collect seeds is to trade them. You may have 100s of Cleome seeds and another gardener has 100s of Poppy seeds. Why not trade a few hundred with each other? Again, you are getting new plants for free or close to it. Seed trading is a whole world unto itself. 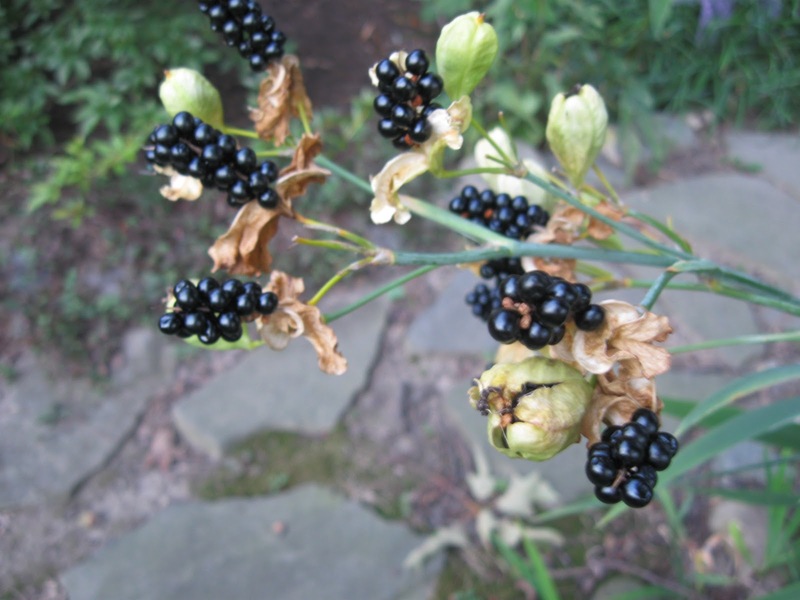 There are online groups, pen pal lists, and clubs for seed swapping. From the Fort Totten metro station, walk to the left (north) out of the station and then turn left (west) down a paved path across a grassy field across from the parking lots -- you'll see the garden just over the crest of the hill. UPDATE: Class is now FULL with wait list. Tomatoes are still going strong at my Fenton Street Community Garden plot. From the looks of others' plots, it is true of most of the others too. I see a lot of the fruit falling to the ground and rotting. I wish folks would come by their plots at least weekly and donate their excess, if they aren't going to be able to eat it all themselves. There are two tomato plants I have yet to get any fruits off of one is an heirloom 'Giant Belgium' and the other is 'Abraham Lincoln.' The 'Lincoln' was a good-sized plant I got in June from the USDA 150th anniversary celebration event. Both plants look healthy and fine, they just don't flower and set fruit. Maybe I'll give them each another dot of organic fish fertilizer. Couldn't hurt. Video Wednesday: OKRA - You Can Grow That! 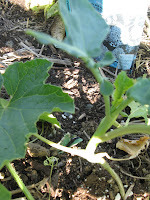 Okra growing basics. Yes, you can grow that! Kathy Jentz, Editor of Washington Gardener Magazine, the publication for DC/MD/VA gardeners, shares her tips for growing and enjoying okra. As some of you may have heard, the You Can Grow That! garden blogger postings will end with this month's round. Here is a full explanation as to why and here is a rant as to why it should not be so. It could easily be resolved, but some corporate citizens just do not play nice. Fear not! The garden bloggers will rise again starting next month with a new theme to promote the love of gardening across the land. Over the past few weeks, Washington Gardener Magazine readers and friends have been submitting their nominations for the "Hottest Gardener in the DMV (District/Maryland/Virginia." I think you'll agree that our local gardening region can boast about some real eye candy -- both beautiful on the outside, as well as the inside. Erin Pitts, she is 30 years old, and does most of the gardening in our 1500 sqft organic vegetable garden in Glen Burnie Maryland. "I hope your readers appreciate her beauty as I get to every day," said her husband, Philip Pitts. Heriberto is a Garden Assistant at the Washington Youth Garden in the US National Arboretum, Washington, DC. He is 28(?) years old. Heriberto learned about farming growing up in Mexico and is now studying horticulture. 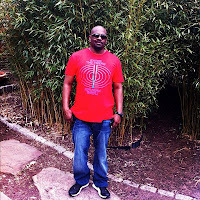 Nicholas Drake Urdy, 40, from Reston, VA, is originally from Austin Texas. He moved to the DMV area in the winter of 1998. He started his first garden around his current home back in 2007. "I decided to tackle the outside and enjoy my passion for gardening by creating my own personal living space through plants," he writes. He is also a student in Horticulture seeking a degree in horticultural science. Rebecca Lemos, early 30s, Co-Founder and Co-Executive Director of City Blossoms, which does fabulous work in the District with children and youth gardening. This pic is from an event in their Girard Street Garden in Columbia Heights just about captures it all. Joe Curley is 26 years old and lives in Pentagon City. He is a horticulturist for the Smithsonian Gardens Greenhouse. "He is sweet, funny AND hot!" said his fans who nominated him. 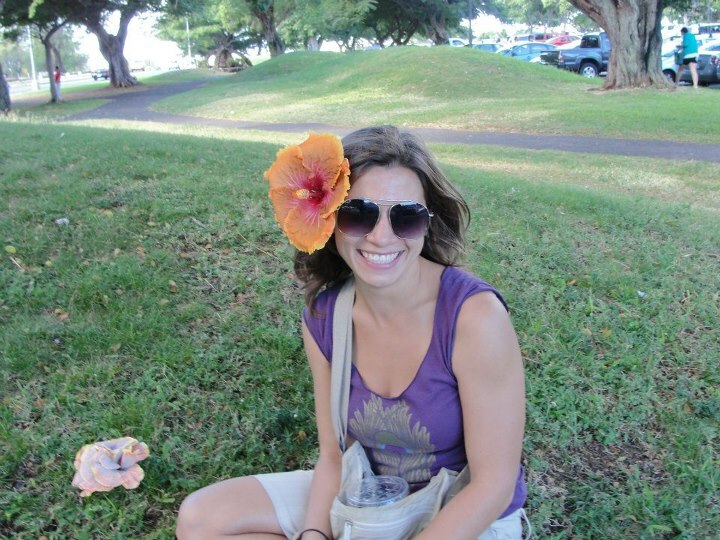 Nadia, 29, is Garden Manager at the Washington Youth Garden in the US National Arboretum, Washington, DC. Nadia is super creative and loves to come up with new theme gardens that will catch kids' interest. William (Billy) Arnold is 29 years old and he has been working landscaping for the last 10 years. He started his own landscaping company called: Carolina Blues Landscaping. Billy’s father worked for Nalls Produce in the Alexandria/Franconia area since he was a young boy and he got his son interested in the business. Billy was born and raised in Alexandria, Virginia and is currently living in Woodbridge, Virginia. Billy is very competitive and loves competing in all things fun. Monique Sullivan gardens in DC, but is originally a New Orleans hothouse flower, so she hasn't minded the 100+ temperatures this summer, spending hours on weekends and evenings outside with the plants. Monique expanded from apartment-window gardening to her own home with yard last year. She built raised beds on a concrete parking pad and grew multiple types of tomatoes, herbs, cucumbers, potatoes, and peppers. Monique also took on working with the Edgewood Community Garden this summer, as well. 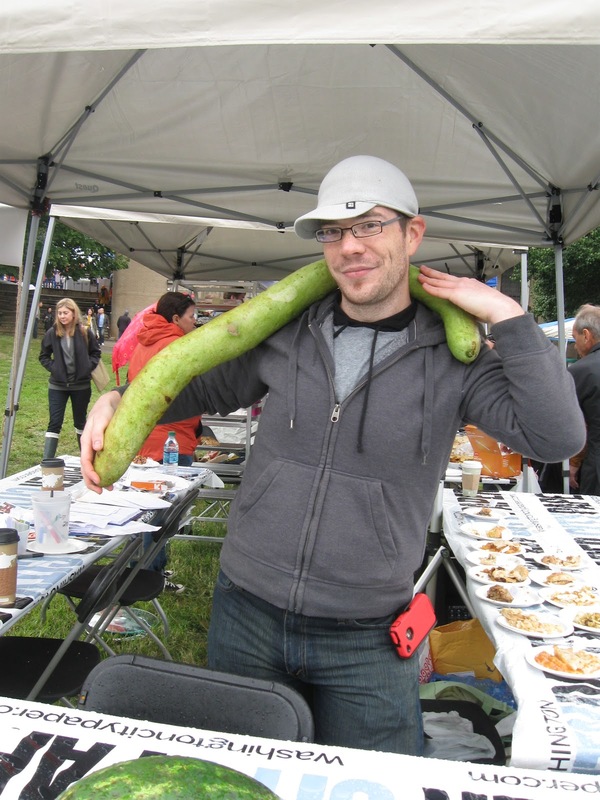 Kenneth Moore is a self-described "quirky gardener in this nation's capital trying to make a difference one seed (literal and metaphorical) at a time." 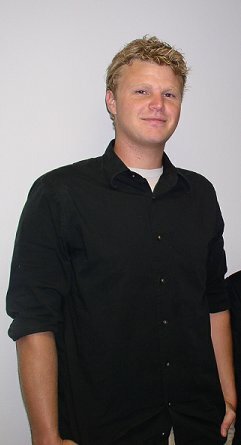 He is a freelance writer who blogs at http://www.indoorgarden-er.com/. 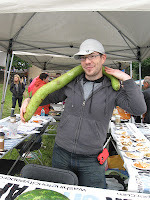 Currently, he is helping boost the DC State Fair to bring much-needed attention to gardening and home arts in the city. 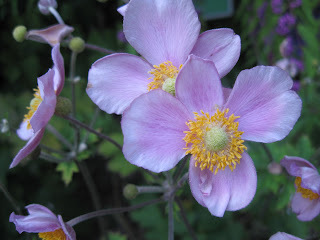 Outside the Visitors Center, Brookside Gardens, 1800 Glenallan Ave., Wheaton, MD 20902. Details: www.montgomeryparks.org/brookside. • Saturday, September 15, The Heritage Harvest Festival, 9 a.m. to 5 p.m, Charlottesville, VA -- The premiere home arts festival on Monticello’s West Lawn. 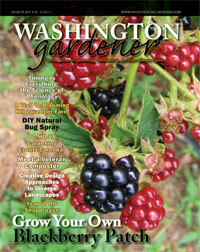 Washington Gardener Magazine will have a table in the Tasing Tent all day on Saturday – stop by to subscribe, renew, or buy single issues. • Tuesday, September 25, Gardener Book Club, 6:00-7:30 PM, Washington, DC at the MLK Library (near Metro Center and Gallery Place). Our first book will be: Founding Gardeners: The Revolutionary Generation, Nature, and the Shaping of the American Nation by Andrea Wulf. So mark your calendars, grab a copy of the book, start reading, and RSVP today to “WG Book Club” at WashingtonGardener@rcn.com.